Sickbay:The sickbay, located on Deck 7, consisted of a circular surgical area with a single bio-bed on a slightly raised dais and a computer workstation a few feet from the bio-bed and an office area to the aft of the surgical area. Around the surgical area was a circular walkway which provided access to the office area and surgical area while still affording the surgical area with a degree of privacy. Between the surgical area and the chief medical officer’s desk, which faced the bio-bed and was in a recessed alcove with LCARS computer access panels on the wall of the alcove, was a duty nurse’s station and pharmacy station. Should the need arise the Prometheus' sickbay is supplemented by the Emergency Medical Protocol, which when initiated automatically activates the trauma ward program in all of the holodecks which recreates a fully equipped trauma ward. 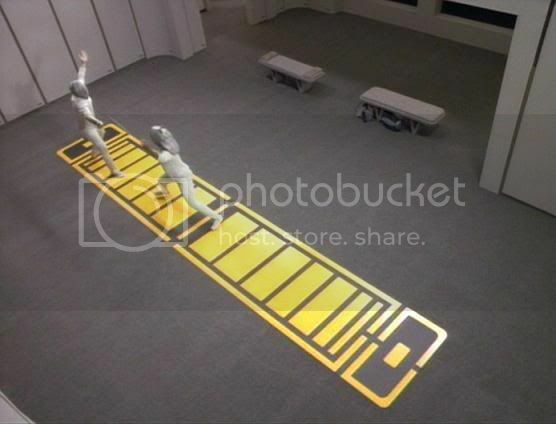 In addition during an emergency selected deck panels are beamed from sickbay to a cargo bay while bio-beds are simultaneously beamed into place in sickbay and connected by engineers standing by in sickbay. As of stardate 56201 (2379) The Prometheus' sickbay underwent a major refit/upgrade as a result of Starfleet Command becoming aware of the woefully under equipped nature of the original configuration in regards to cases of multiple patients need to be treated at the same time with little or no fore warning. As a result the Prometheus' sickbay was upgraded so its simultaneous treatment capabilities equaled those of the Intrepid class' sickbay. The new sickbay is equipped with the chief medical officer's office, a load-out of three state of the art bio-beds along one wall and one dedicated state of the art surgical bio-bed in the surgical bay, and a small medlab. As a result of the upgrades to the sickbay the Prometheus' medical capabilities were significantly expanded thereby allowing the ship to potentially be assigned to more medical oriented missions than previously possible given sickbay's original configuration. Counselor’s Office: The Counselor’s office is located on Deck 5 to assure a more efficient medical treatment environment. The Counseling suite consists of three small offices for staff on duty a common area and the Chief Counselor's office. The usual plain duranium walls are softened with an atypical palette outside of the normal Starfleet gray and blue. There are no visual sensors in this office and audio recordings are done only with the voice code of the Counselor. General Overview: All crew and officers' quarters are located on decks 3, 4, 6, 9, 14, and 15; with special variable environment quarters on Deck 11 for crew with special comforts. Individuals assigned to a Prometheus class for periods over six months are permitted to reconfigure their quarters within hardware, volume, and mass limits. Individuals assigned for shorter periods are generally restricted to standard quarters configuration. 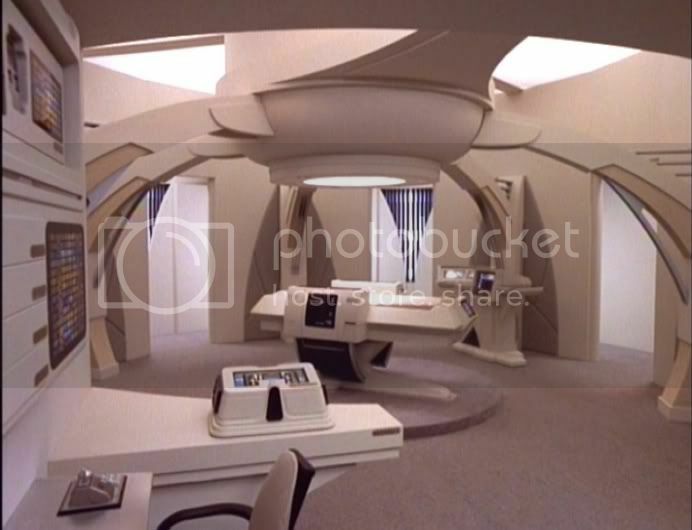 Crew Quarters: Standard Living Quarters are provided for both Starfleet and non-commissioned Officers. This includes their families as well, those officers with children are assigned larger quarters with viewports. Due to the mission profile of the Prometheus class Vessel, crew accommodations aboard are generally less comfortable than other ships of the line. Officers' Quarters: Starfleet personnel from the rank of Ensign up to Commander are given one set of quarters to themselves (cohabitation is not required). Executive Quarters: The Captain and Executive Officer aboard a Prometheus class both have special, much larger quarters on Deck 3. These quarters are much more luxurious than any others on the ship, with the exception of the VIP/Diplomatic Guest quarters. Both the Executive Officer's and the Captain's quarters are larger than standard Officers Quarters, and this space generally has the following accommodations: a bedroom, living/work area, bathroom, food replicator, ultrasonic shower, old-fashioned water shower, personal holographic viewer, provisions for pets, and even a null grav sleeping chamber. The Captain’s quarters are on Deck 3, forward most position, with an expansive view of the bow of the ship and beyond. VIP/Diplomatic Guest Quarters: The Prometheus class is a symbol of UFP authority, a tool in dealing with other races. Wide-ranging and exploratory as the class’s mission profile is, the need for VIP quarters is critical, if not often. These quarters are located on Deck 2. These quarters include a bedroom, spacious living/work area, personal viewscreen, ultrasonic shower, bathtub/water shower, and provisions for pets, food replicator, and a null-grav sleeping chamber. These quarters can be immediately converted to class H, K, L, N, and N2 environments. While smaller in size than those facilities aboard a Galaxy class or the newer Norway class vessel, they are still far superior in fit and finish when compared to Starfleet Officer quarters. General Overview: Many of the Prometheus class’s missions take extended periods of time far from the usual niceties of Federation Starbases for R&R; as such, the ship is equipped to provide a home away from home for the Crew and their families. Holodecks: There are two medium-sized holodecks aboard the ship. Located on Deck 3 and 5, these Holodecks are proprietary Federation Technology and can comfortably support up to 15 people at a time. Target Range: Test of skill is an important form of recreation in many cultures, and the Intrepid class provides a facility especially for such pursuits. The facility sports self-healing polymer absorptive targets for a variety of projectile and bladed weapons firing and/or tossing. In the rear of the Target Range facility is a locked area protected by forcefield in which phased weapons firing is done. The phaser range is also used by security to train ship's personnel in marksmanship. During training, the holo-emitters in the phaser range are activated, creating a holographic setting, similar to what a holodeck does. Personnel are "turned loose;" either independently or in an Away Team formation to explore the setting presented to them, and the security officer in charge will take notes on the performance of each person as they take cover, return fire, protect each other, and perform a variety of different scenarios. All personnel on an Intrepid class are tested every six months in phaser marksmanship. Gym Facilities: Some degree of physical fitness is a requirement for Starfleet Officers and all starships provide some sort of facilities to maintain that aboard. On Prometheus class vessels, these facilities are not overly spacious, but well outfitted and located on Deck 5. The facilities include variable weight machines, isometric machines, and callisthenic machines and a sparring ring configured for Anbo-Jitsu but easily modified and/or expanded for other practices. All equipment is equipped with the ability to variate gravity for those species that are physically biased toward higher or lower than standard gravity. An emergency medical kit is located in an easily visible location near the door to the Gym. The crew mess hall serves double duty aboard the Prometheus class due to the ship’s workhorse nature. Located in the forward section of Deck 4, the Mess is equipped with a two mass-use food replicators with an extensive recipe listing from over two hundred worlds. Eating accommodations are provided by a slew of tables and chairs. Aft Lounge: At the rearmost part of the secondary hull on Deck 14 sits the aft lounge, a crew recreation area. The Aft Lounge has a battery of recreational games and assorted "stuff.” 3-D chess, octagonal billiards tables, and a storage center with more eclectic games such as Plak-tow can be found in the mess hall.